ABC Reprographics provides custom engraving services for trophies as well. This includes custom engraving on Denver trophies you or someone else might have won. 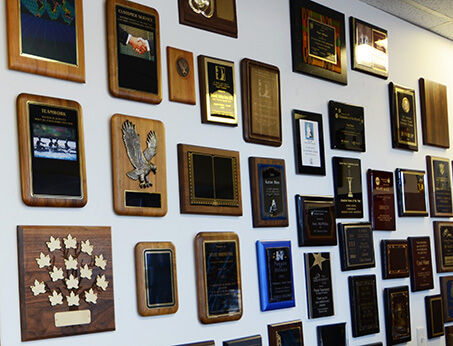 You can request personalized lettering and messages on all types of awards, including plaques, trophies, pins, medallions, framed photos and more. We have about a dozen materials we can use, and our team of caring, experienced professionals is trained in the finest techniques. We ensure your custom engraving for your Denver sports team’s award dinner, non-profit charity event, press conference, or professional association depicts true success. The artwork we execute on your plaques is sure to deliver your business or organization the recognition it deserves for a job well done. Additionally, you might want engraving performed on any one of the kinds of promotional products we offer. Please see our store where you can choose from a variety of drinkware, key lights and other small, easily distributable items. We will engrave them with whatever message you want. Feel free to contact us any time with any questions you have about our engraving services in Denver. We also provide a wide range of print and copy services. You or someone you know has just accomplished a great feat, or you want to plan for your sports’ team’s future. We provide trophy engraving for athletic associations in Denver that school teams and recreational organizations need. Make us your one-stop shop for all of your plaque engraving for Denver organizations. ABC Reprographics encourages schools to get creative when giving students recognition. You can create plaques for perfect or excellent attendance, most improved grades, or highest GPA. Of course, we are always ready to provide award engraving for Denver graduations. Personalized scissors and knives, name plates, and wearable medals are ideal for military use. You can also use them to honor anyone who has excelled in any kind of outdoor survival sport. Certain types of jewelry might also work well for commercial promotions and can be handed out at expos and trade shows. These items work well for any type of promotion because you can have business names printed on all materials to help you establish a brand. If you have any questions about our trophy engraving in Denver, please contact us at your earliest convenience. The other pages of our site also give you more information that you need concerning both custom and standard orders of all our products.